Nathan Buchman of Potomac Bead Company sent me some samples of their wonderful new AVA® beads: hand-pressed, 10x4mm, three-hole, angled beads shaped like a “v”! 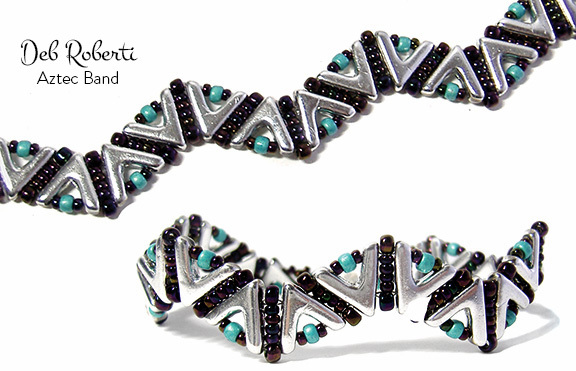 I had a lot of fun playing with them and designed this simple band that really highlights these cool beads. Leaving about a 10-inch tail for attaching the clasp, string three size 11/0 seed beads and go through the bottom leg of an AVA bead. String an 11/0 seed bead, a Color1 8/0 seed bead and another 11/0 seed bead. Go through the top leg of this same AVA bead. String four 11/0 seed beads. Go through the hole in the center peak of this same AVA bead. Step 3: Go up through the hole in the center peak of a new AVA bead. String four 11/0 seed beads. Go down through the top leg of the AVA bead that you just strung. String an 11/0 seed bead, a Color1 8/0 seed bead and another 11/0 seed bead. Go through the bottom leg of this same AVA bead. Step 6: Go through the center hole of a new AVA bead. Step 9: Go up through the bottom leg of a new AVA bead. String an 11/0 seed bead, a Color1 8/0 seed bead and another 11/0 seed bead. Go up through the top leg of this same AVA bead. String four 11/0 seed beads. Go down through the center hole of the AVA bead that you just strung. Step 12: Go up through the bottom leg of a new AVA bead. 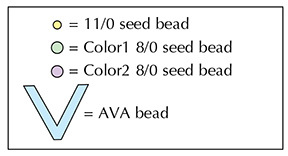 String an 11/0 seed bead, a Color1 8/0 seed bead and another 11/0 seed bead. Go up through the top leg of this same AVA bead. Step 15: Go through the center hole of a new AVA bead. Step 18: Go through the center hole of a new AVA bead. Step 21: Go up through the bottom leg of a new AVA bead. String an 11/0 seed bead, a Color1 8/0 seed bead and another 11/0 seed bead. Go up through the top leg of this same AVA bead. Next you will add Color2 8/0 seed beads in the gaps between the AVA beads. This will give the band some needed stability and keep it from rippling. Step 34: String an 11/0 seed bead, a Color1 8/0 seed bead and an 11/0 seed bead. 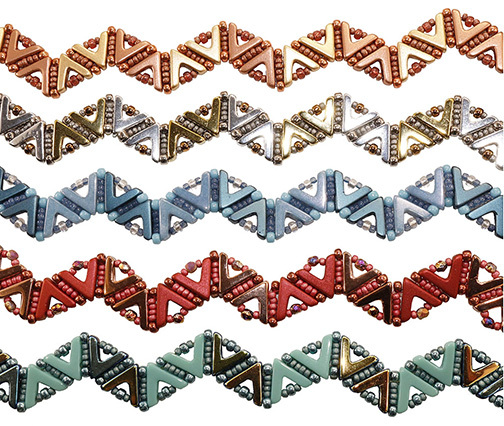 NOTE: To lengthen your band, just add more beads—or larger beads—in this step. Step 35: String another 11/0 seed bead. Weave back into the band, knot in several places and then cut your thread. Thread your needle with the tail thread from Step 1 and repeat Steps 34 to 36 to add the other end of your clasp.